India’s new government will actively encourage development and settlement along India’s disputed border with China. Prior to its election, India’s new government was expected to be considerably more active in pressing India’s claims to its disputed borders with China. While a recent trip by China’s foreign minister focused primarily on economic and trade matters and sidelined contentious political issues almost entirely, recent reports in the Indian media suggest that the Bharatiya Janata Party-led government is planning on engineering settlements along India’s disputed border with China in Arunachal Pradesh, in the country’s northeast. India administers Arunachal Pradesh while China claims almost the entirety of the state as its own territory. Chinese foreign minister Wang Yi met with Indian Prime Minister Narendra Modi less than a week ago and pledged to work towards resolving the border disputes between the two countries. According to The Indian Express, the National Democratic Alliance (NDA) government plans to spend $830 million (50 billion rupees) to encourage Indian villagers in the northeast to settle areas closer to the Sino-Indian border. So far, it looks like the central government is not planning on offering direct cash incentives to settlers but will instead use the earmarked funds for infrastructure development. The northeast has generally been neglected by previous Indian governments, particularly northern Arunachal Pradesh, which contains very little infrastructure on the Indian side of the border. China, by contrast, has not been shy to build infrastructure along the disputed border in an attempt to demonstrate to locals that the Chinese government might better serve their interests. India’s current Minister of State for Home Affairs Kiren Rijiju is originally from Arunachal Pradesh and is likely the originator of this initiative. “The negative policy of the past — that the border should be closed, not be accessible to civilians, not be developed — will be done away with. We have come to the conclusion that we must initiate steps to enhance our capacity, manpower and developmental activities along the border. Fences cannot be there; there is no demarcation,” he noted in a prior interview. He adds: “If we have adequate manpower guarding those areas, there will be no chance of their forces transgressing. A massive road network, telecommunication, landing ground and facilities to be created for security forces, amenities and access to people. Why should people be restricted from going [to] till the border areas?” The Indian government, in addition to the $830 million that will be devoted to this initiative, has another $39 billion (240 billion rupees) earmarked for other critical infrastructure in the area, including roads and border outposts. Part of this plan was developed during India’s previous United Progressive Alliance (UPA) government. In particular, India began to steadily increase the number of Indo-Tibetan Border Police in Arunachal Pradesh, add new border outposts, and maintain a more forward position along the disputed border to deter any Chinese incursions. The land that currently comprises Arunachal Pradesh was an important front in the India-China War of 1962. After India’s defeat in that war, subsequent governments in New Delhi chose not to prioritize infrastructure development in the area and generally discouraged inhabitation there. The fear was that any roads installed by New Delhi in the region could be used by a potential Chinese invasion force. 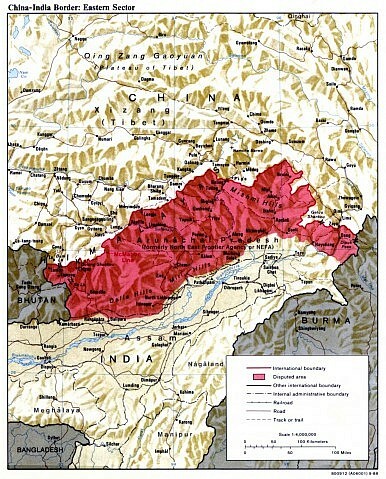 During the 1962 war, the northeastern front was particularly brutal due to how difficult it was for India to establish reliable military supply lines to the region. The governor’s communique emphasized that the central government should undertake this project “on a war footing.” The new BJP government appears to be keen to reverse over this decades-long consensus in India’s northeast policy and actively develop the area.